The T71 DA is an American tier 7 light tank. Experimental airborne light tank with an oscillating turret and automatic loading. Developed by Detroit Arsenal from 1952 through 1953 as a replacement for M41. The armament was deemed ineffective, and the development was stopped after one wooden prototype had been built. The T71 DA leads to the T69. Upgrades are relatively quick to unlock, makes a decent amount of credits if played wisely. Due to the unusually large engine blocks and tracks, a single shot has a high chance to detrack you and disable your engine. APCR and HEAT rounds have poor normalization which can be a liability against sloped armor. Originally somewhat forgotten because of the popularity of the M41 Walker Bulldog (which was also tier 7 at the time), the T71 has seen an increase in popularity since the introduction of the tier 9 and 10 light tanks. In-game, it possesses similar properties to the French AMX series of light tanks except the camo which is lower (14/14 vs 18/18). The pacing between shots is 2 seconds on both guns in a 6-round revolver magazine. It has good dynamics, but care should be taken to avoid being hit in the hull, as the engine is especially weak when stock and is destroyed easily. The gun can be considered outstanding for its tier, with 900 potential burst damage over 10 seconds, compared to other autoloader lights around its tier that does ~700 per drum. 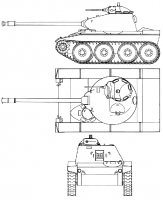 145 penetration is acceptable given the light tank chassis, which encourages flank and rear shots. If forced into a shootout, the HEAT rounds with 210mm penetration comes more than handy: these are capable of cutting through a Ferdinand, or a Type 59 frontally, but will also lead to an astounding ammunition bill post battle. As with the French tanks, the best combat strategy is to flank a distracted enemy and unload as many of your rounds into their weak areas as you can without taking damage, then withdrawing to repeat on other targets of opportunity. Special attention should be given to one-shot targets, as the T71 can kill several weak tanks very quickly given the chance. Because of its great turning and top speed it can also circle tanks with low agility, leaving them entirely defenseless. This should only be attempted on isolated tanks, however. Its great view range and good agility make it an excellent scout, both active and passive. Active scouting at these tiers becomes risky however, as both alpha and accuracy are better than previous scout tanks have seen. Also, active scouting increases the chance of getting into a confrontation with a high-tier medium, a situation the T71 is ill-equipped to deal with. The top cannon is 500kg lighter than the stock one; by researching this, you save on tracks for a while and can mount some equipment. The upgraded engine gives you an additional 70 horse power and more than double amount of module hitpoints. The Tier X radio almost doubles the signal range, boosting it from 410 to 745 metres. The tracks are not required to mount anything, but give better terrain pass-ability and better track traverse. Little is known on this unusual US tank because the T71 never actually made it out of the factory and onto the battlefields. It suffered the fate of many interesting vehicles that were thought up in the post-war era, when the US tank manufacturing industry was very rich in ideas but became increasingly poor in funding. Armed with the experience gained from the industry’s previous rapid expansion, the US engineers were looking to improve their entire line-up of light, medium and heavy tanks, and try out new and sometimes experimental designs on them. When some of those experiments didn’t turn out quite as everybody had hoped for, projects were quickly dropped, as in the case of the T71 that only existed in mock-up form and never actually saw the light of day. 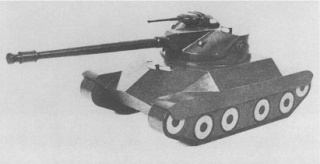 The few available records say that its development began in the early 50s when the US Ordnance Committee ordered a new light tank with very specific characteristics, aimed at replacing the T41E1 –which itself had already been the improved successor of an upgrade of the experimental light tank T37. Being the third generation of an experimental vehicle, the T71 was meant to continue the same bold nature by sporting a heavy 90mm calibre gun on a 20 ton light weight structure. 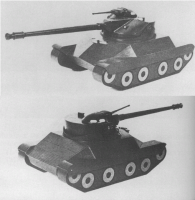 Manufacturers such as the Detroit Arsenal Tank Plant put forward their plans featuring an oscillating turret that would be able to handle the recoil of the cannon. This was a rather unusual technology that was only used in a couple of tanks worldwide. As the tank was meant to be carried airborne, its ultimate weight had to be reduced even further, which limited possible armament to a 76mm gun, but in turn enabled the use of an auto-loader. The designers had bet on quantity over quality, giving the tank an impressive firing rate (before the unavoidable drum reload of course) and an ammo rack capable of carrying up to 60 shells of different types. Light-weight and equipped with a decent AOI-628 engine in the rear hull for agile quickness, the engineers thought they had created a nimble scout and artillery support tank. However, they had forgotten an important aspect: the armour. Due to the imposed weight restrictions, the tank was covered in “paper-thin” 25 mm armour which failed to impress the Ordnance Committee. Ultimately its performance just did not live up to the necessities of changing warfare of its time. The project was scrapped in 1953 with nothing but a wooden model to show for it. 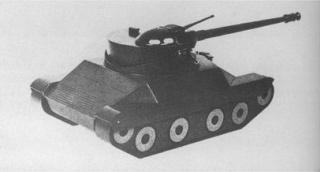 The T71 only existed as a wooden mockup, of which no historical records of its armor or performance specifications exist. These two volumes are widely regarded as the definitive reference works on the American Light Tanks. Volume-1 covers the real life counterparts of the in-game light tanks: T1, T2/M2, M3, and M5 series and the T21 and the M24. Volume-2 covers the T-71. Hunnicutt, R.P, 1992, Stuart: A History of the American Light Tank - Volume-1, Presidio Press, 508p, ISBN:0891414622. Hunnicutt, R.P., 1995, Sheridan: A History of the American Light Tank - Volume 2, Presidio Press, 340p, ISBN:9780891415701. This page was last modified on 25 October 2018, at 08:41. This page has been accessed 400,158 times.